If you've been to a Cars and Coffee event or a car show in the last few years, you've probably seen a Blipshift shirt or two. 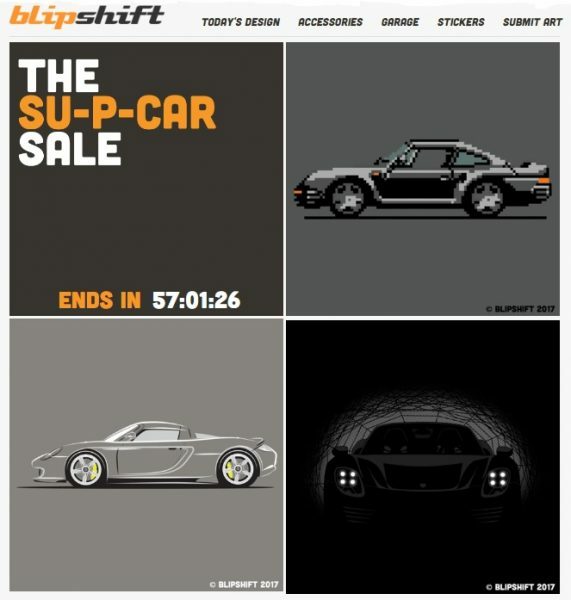 Blipshift's designs are usually quite clever, and are only offered for 24 hours at a time. Recent weekend sales feature three shirts offered for three days, starting on Friday. This weekend's sale is Porsche-centric, featuring the 959, Carrera GT and 918 Spyder. The designs are attractive, particularly the mysterious-looking 918. T-Shirts start at $15, and are available in short and long sleeve, as well as sweat shirts and prints. All three shirts can be seen on the Blipshift homepage, and the individual designs can be found at their individual pages. Click the model designations to jump directly to the 959, Carrera GT, or 918 Spyder.